Two pieces of good news, just in time for Valentine’s Day. We strongly suspect that significant marginalia by John Stuart Mill resides in John Locke’s Works(1823) and Richard Cobden’s Speeches on Questions of Public Policy(1870), by James Mill in Henry Thornton’s Enquiry into the Nature and Effect of the Paper Credit of Great Britain(1802) and William Spence’s Britain Independent of Commerce(1807), and by David Ricardo in William Blake’s Observations on the Effects Produced by the Expenditure of Government(1823). Time will tell whether we were right. We are grateful to the Delmas Foundation for making this line of inquiry possible. 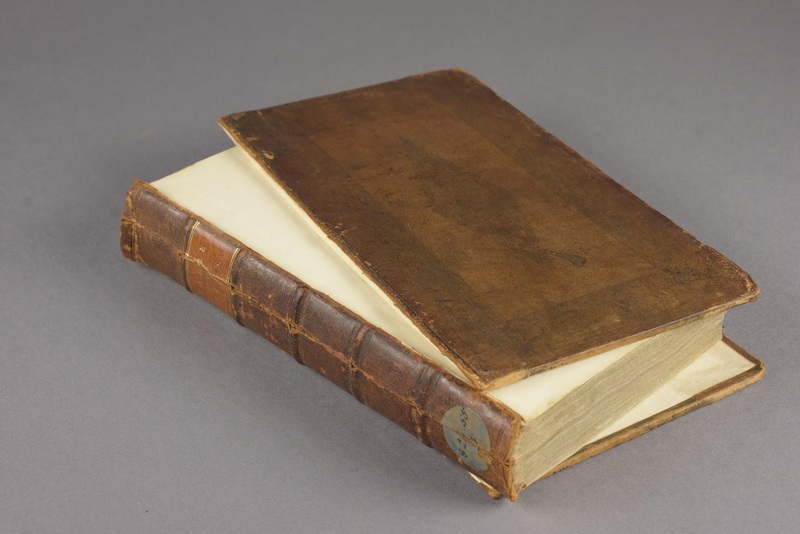 Amongst the books treated during the conservation project were two volumes from a set of four of A. Tocqueville’s De la Démocratie en Amérique, volumes 3 and 4. 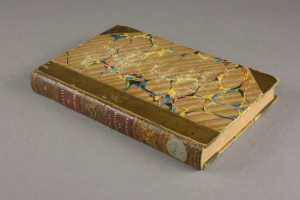 The books were bound in half leather bindings with hollow backs and marbled paper sides as is typical in the 19th century, but the leather and tooling were different in volumes 3 and 4 and they were also more damaged. Each of the books had both boards detached and most of the spines missing, and the original plan was to re-attach the boards and make new leather spines. 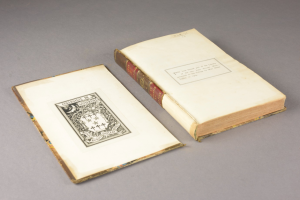 It was only after the two books were brought to the conservation studio for treatment that an envelope with fragments of the two detached spines was found in the library and they could be reunited with the books. 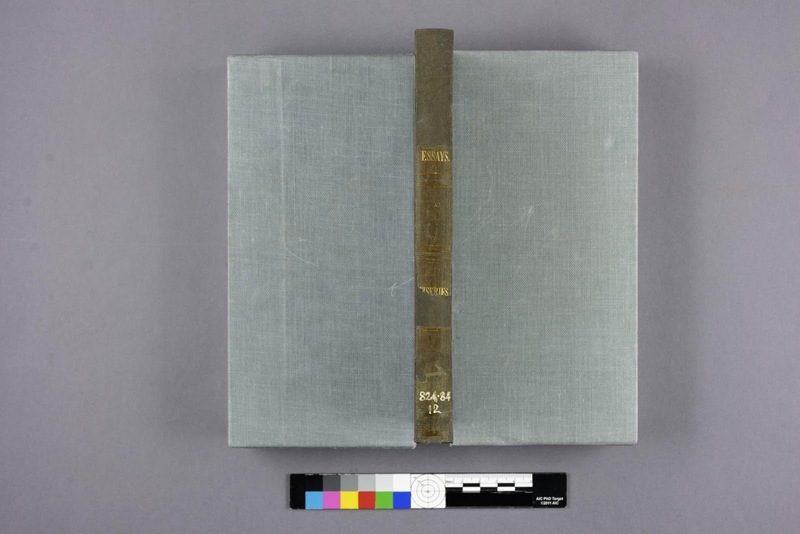 The repair of the books was very similar to the treatment described in the previous conservation blog: ‘The slot machine: Reuniting boards with books’. The remains of split paper hollows were removed and both spines were lined with aerocotton which strengthens the spine and to which the boards can be attached. 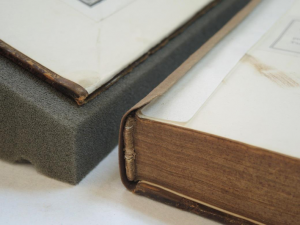 To make sure the fabric was firmly fixed to the spine and not relying only on adhesive, the lining was sewn through to the outer quires as well and the books were ready for board attachment. 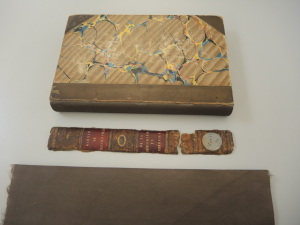 In this case the lining extensions were pasted to the outside of boards, underneath the leather cover, and left to dry before making a tube hollow for each of the books. The spines were now ready for covering. When pieced together, the original spines were nearly complete with only very small fragments missing. This meant that only small portions of the any new spine covering material would be seen and that toned Japanese paper would be sufficient the cover the tube hollow and book joints. Once the original spines were pasted back, the books were finished and ready to join the others on the shelf. 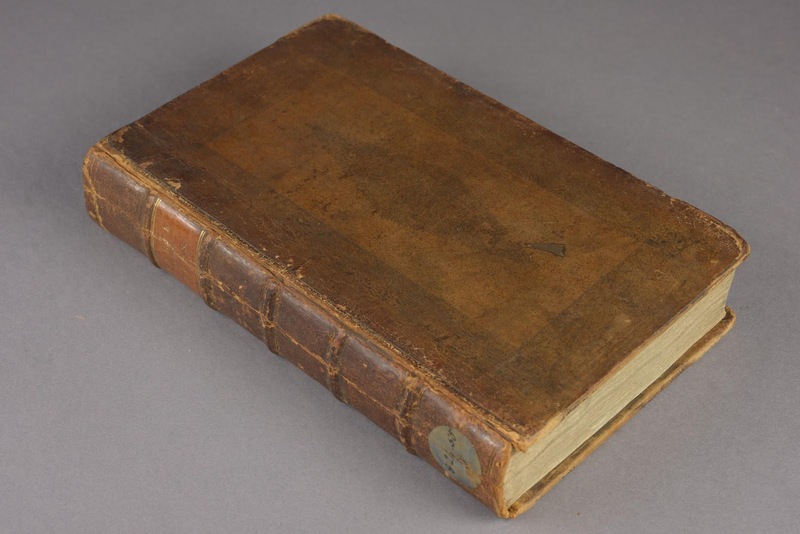 There are multiple ways that conservators can reattach the boards of books, and each time we choose the option that best suits the needs of the particular object. 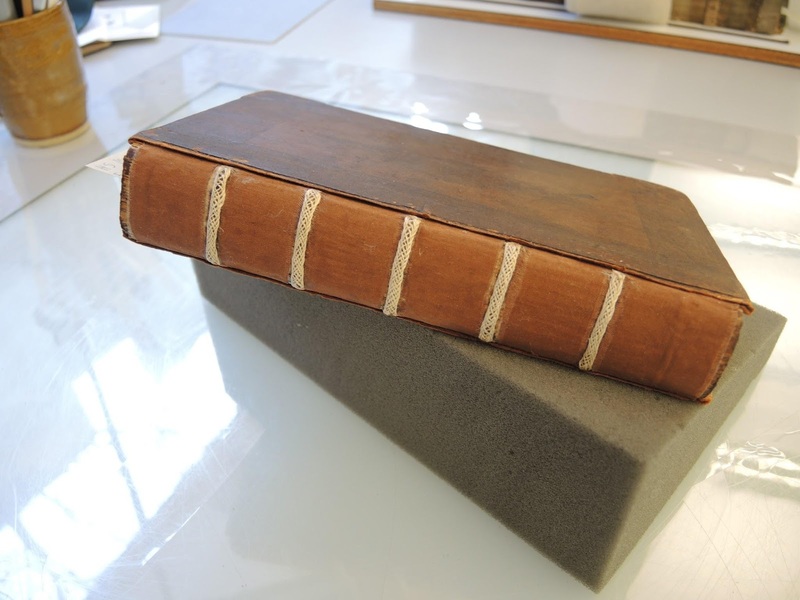 A particularly strong and durable board reattachment technique is called ‘board slotting’, which was developed by Christopher Clarkson during his time working in the conservation department of the Bodleian Libraries. It involves using a specialised machine to cut a slot along the spine-edge of the boards, and then inserting textile flanges into the slots in order to reattach the boards to the text block. 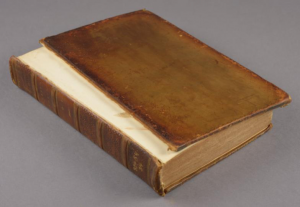 It is particularly suitable for books with ‘tube hollows’ – that is, where the leather is not directly adhered to the book’s spine, but instead to a tube of paper that has been glued to the spine beforehand. 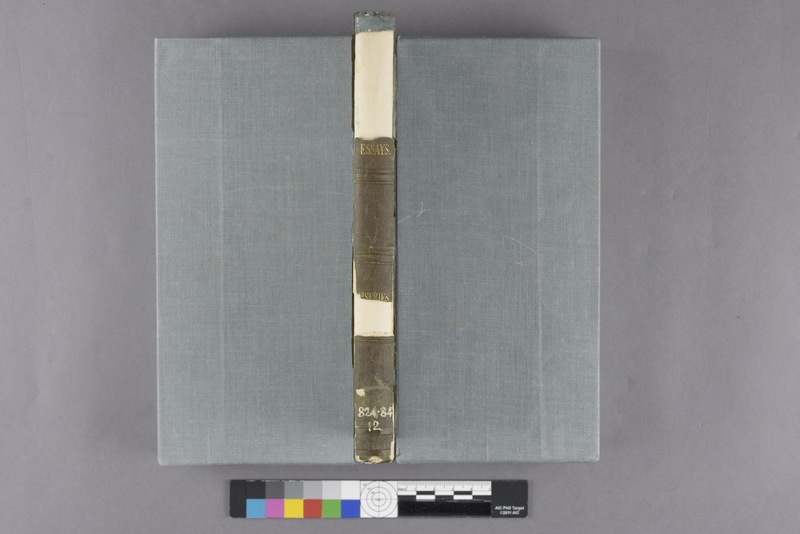 Opening of a book with a tube hollow – note the way the leather moves away from the spine of the book as it opens. 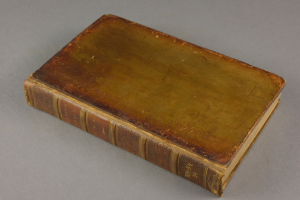 Board slotting was judged to be the best option for a number of the books in the collection. First, the hollow of the book is split to allow access to the spine. The spine is then prepared by cleaning away the old linings and glue, and replacing them with layers of strong, flexible, archival materials: namely, Japanese paper and aerocotton. A spine-piece of toned aerocotton is then prepared and glued to the first lining to form extended ‘flanges’ of textile on either side of the spine. This recreates the hollow of the original structure while also forming the basis for the board reattachment. OCC conservator Lisa Handke slotting a board using the Jeff Peachey board slotting machine. The board slotting is done using a machine adapted by American conservator Jeff Peachey. The textile flanges are then cut to size and inserted into the slots with some adhesive, reuniting the boards in their proper place. A textile flange trimmed to the right length, ready to be inserted into the slot. 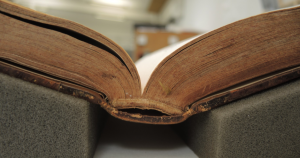 The original spine can then be adhered back in place, giving a neat finish to the conservation treatment. Alongside the digitisation of the marginalia, the collection is also being conserved so as to preserve the physical objects for posterity. A knock on effect of digitisation projects is the increased interest in the objects themselves, and there are a number of treatment approaches that can strengthen the often fragile volumes. In conservation, we are not trying to make the object look ‘new’, but rather to use techniques that preserve as much of the original material as possible while still restoring a functionality to the volume. Often the books will look very much the same on the outside, but they won’t fall apart when you open them. In this example I adhered kozo-fibre paper and textile spine linings underneath the original spine. These held together the split in the textblock, and formed part of the board attachment on the book. 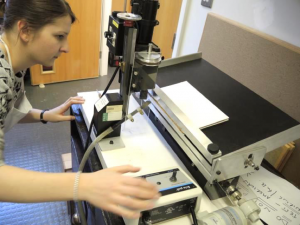 The conservation treatments are carried out at the Oxford Conservation Consortium, where our busy team work for the library and archive collections of 17 Oxford colleges. We are also the custodians of the Chantry Library, a collection of conservation literature open to the public. You can read more about the Chantry here. Welcome, all, to Mill Marginalia Online! Our earlier in-process site will soon disappear, replaced by this new, functional iteration of our work (millmarginalia.org). Thanks to the indefatigable Tyler Grace and Nadia DelMedico, as well as to the eagle eyes of our advisory board members (with Anna Gibson and Phyllis Weliver deserving special acknowledgement), our private beta site has been tuned, expanded, and beautified into the public web presence you can now see and browse. Although we foresee future refinements to the search function, marginalia categories, and methods of attribution, and we of course anticipate the addition of further data, we are proud to present the first 10,000 examples of marginalia from the John Stuart Mill Library. Those who would like a bit of guidance in using the site are advised to consult the brief “How to Use This Site,” located in the About section. Or you can just click your way in to a virtual visit, and get to know the Mills in a whole new way.